I received the package from Rickey with their Break Away Frame/Fork. I bought the 52 cm Road version, steel frame and carbon fork. It comes with a case, headset, inline adjusters for the derailleurs that are used with a connector on the frame (not a very good design by the way) and three inline disconnects for the two derailleur and rear brake cables when you take it apart. First thing I did was to weigh all the parts. The frame and fork weigh 2180 grams (4.8 lbs). The included headset weighs 5.3 oz (150 grams) for a total weight of 2,330 grams or 5.1 lbs. That is before cutting the steer-er tube to size so it might be a few ounces less. The way the system works is that the frame breaks apart into two sections. They are joined with a clamp near the bottom bracket and also the seatpost forms the second connection. I had already purchased most all the additional parts needed with the exception of the seatpost and stem since I wanted to see how it all fit before I decided on the stem length and seatpost setback. I have a spare stem to get started with. I used a seatpost and saddle I took off an older bike so I could get the bike assembled. The seatpost is needed to hold the two parts of the frame together, with the other connection near the bottom bracket being made by way of a special clamp. The headset was not installed so I decided to take it to the local bike shop for that since I don’t have a headset press. Within a few hours they called me and told me it was done. It was $30 well spent since that included cutting the steerer tube.. Note that although it came with a headset there are no spacers for use under the stem. I was not sure what stack height to use. Looking at the Richey installation information online they said to limit it to 30 mm, so I used that. You can always reduce it later but once you cut the tube that sets the limit. For the components I installed DuraAce 7800 that I had replaced on my Trek Madone 6.9. A couple of years ago I had replaced the double crank with a DuraAce 7950 compact and more recently I replaced the shifters, brakes and derailleurs with 7900 series. So I had a complete set of components, but for now I will see how I do with a double crankset, something I rode all the time until two years ago. For wheels I move the Maric Krysium SLs I had on my spare road bike and put the original wheels on that bike. I put on a spare set of Speedplay pedals and weighed the final bike. It came in at 17.5 lbs, quite nice for a travel bike with a steel frame. This is around the weight of my older road bike, the Trek 5200 with the same wheels on it. The bike comes with a travel case which measures 8.5″W x 26.5″H x 31″L with adds up to 66 linear dimension. Most airlines say 62 is limit but most people report they get charged as regular suitcase as long as under 50 lbs. You can see how much more compact this travel case is compared with a regular bike case I own (on the left). I added a water bottle cage, a saddle bag, and mount for my Garmin 500, and was ready to roll. Two miles into the ride I decided that the stem was too long. It was a spare one I had to test out but I felt I needed a 70 mm stem, like I have on my Trek. I returned home and pulled one of that size off the tandem and put it on. That felt just right so the bike size and fit is almost the same as my Trek Madone 6.9. The bide very nicely. I forgot how effortless the DuraAce 7800 double crank shifted. I am very glad I bought this frame to use my old components on. It has the advantage of being a travel bike. I found this video on the web on how to pack the Richey Break Away. Although the summer is almost over, with the first day of Fall coming tomorrow, the temperatures had turned much warmer than usual. It was about 97 degrees when we headed out at 5:15 pm for our weekly mountain bike ride at Harvey Bear Ranch. This is one of my favorite rides of the week because this County Park is very close, almost in our backyard, and the trails are great. About five of the Nightriders showed up for the ride, which we had to push to 5:15 pm start since the park closes at sunset and the days are getting shorter. We made our way up over the hill and headed down to Coyote Lake where we knew we would be in the shade as the temperatures starts to cool off and where we could get more water. Then it was backup up the hill and then down the roller coaster of a single track where Jimbo became a cowboy and herded the cattle. The late afternoon sun glistened on the golden hills making for some breathtaking views. You can see why they call California the Golden State. 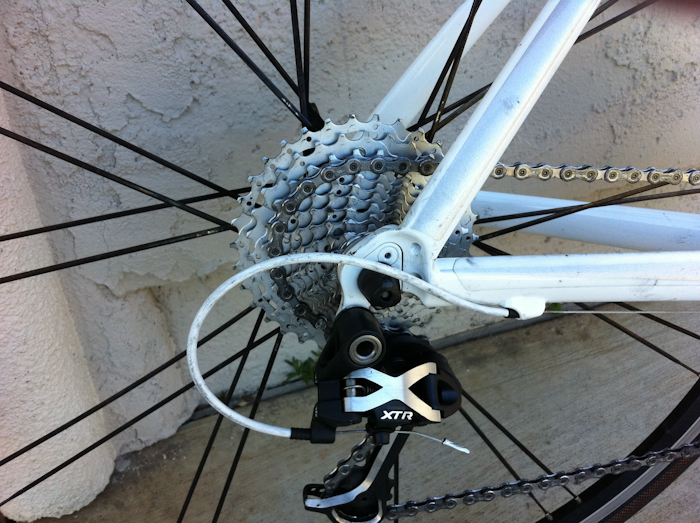 Two years ago I installed a mountain bike (MTB) derailleur (Shimano XTR) and cassette on Anne’s road bike at the time. See the prior post. At that time all MTB setups were 9 speed but her road bike was a 10 speed. Although there was a 3rd party 10 speed cassette with a wide range, it was expensive and most people didn’t feel it worked very well. So back then I used a device to allow you to use 10 speed shifters with a 9 speed MTB cassette. The device, which had two concentric pulleys, changed the cable pull as needed. It worked, but never worked very well and it seemed very hard to adjust things so it would shift smoothly. It also meant that one of the index positions on the shifters would not work since there were only 9 cogs. Anne got a new road bike last year and has been doing well with a triple chain-ring and a 12-27 cassette. In the meantime Shimano has come out with 10 speed MTB gearing setups. So for a relatively small price I bought a Shimano XT 10 speed cassette (Shimano XT M771-10) with a range of 11-34 and moved the XTR derailleur (RD-M971) from her old road bike to her new bike for those few times when she might need that extra low gears. Most road derailluers are limited to no more than 28 or 29 maximum teeth on the cassette. SRAM does sell a road derailleur as part of their APEX group that will accommodate a wider range, up to 32. These are designed for use with a compact crank, although they may work with a triple also. The other approach is to use a mountain bike oriented rear derailleur. A word of caution is in order. For many years Shimano kept the cable pull the same between their road and MTB shifters. However with their 10 speed MTB bikes, they changed the cable pull. Therefore, you can not buy a 10 speed rear MTB derailleur and have it work with 10 speed shifters on a road bike. Instead, you need a 9 Speeed derailleur. That might sound wrong since it will be used with 10 speed shifters but the XTR is not indexed and the indexing is all done with the shifters so it works just fine since it matches the cable pull on the 10 speed road shifters. Another point is you need to use a “top normal” derailleur. High normal or top normal rear derailleurs return the chain to the smallest sprocket on the cassette when no cable tension is applied, the same as with road bikes. Many newer mountain bikes have a bottom normal or rapid rise shifter which is opposite, where the derailleur moves to the largest cog with no cable tension. It would work on a road bike but everything would be backwards and should be avoided. For Shimano the right model is RD-M971 for the XTR series and RD-M771 for the less expensive XT series. Using this simple formula, you would need a derailleur with a 46T rated capacity to absorb all the possible extra links and allow you to use every conceivable gear combination. The Shimano long cage allows for 43T, and knowing that Shimano is conservative, then it should work fine. If you have something other than a triple, use your own values in the formula above. For example with a double crank (53-39) and a 11-32 cassette, it is 35 so a medium cage is sufficient. Although they sell cassettes with a capacity up to 36, most 9 speed derailleurs only accommodate up to 34. This is what I installed, but you might consider using something like a 11-32. That will still give you a very low gear and less of a jump between gears and you can buy a road cassette (SRAM with the range 11-32). Another word of caution is about the chain. Anne has a triple crankset so according to Shimano you should not use the newer chains (such as the CN-7901), which are only suppose to be used with a double (or compact) crankset. That is true even if you have the latest Shimano Ultegra Triple. They recommend instead the older model CN-7801 or CN-6600 chains. However for the cassette I installed, they recommend the CN-HG94 chain, which is for the Dyna Sys mountain bike setup and is directional (like the new DuraAce chains) so I would avoid that. It is not as simple as when you would be a chain from Shimano and it said for either DuraAce or XTR. Having on hand a new DuraAce CN-7801 chain I used that and it worked fine. That is what one with a triple crank should be using, even if they have a regular road cassette. It didn’t take long to install the XTR derailleur and new 11-34 10 speed cassette. I put on a new chain while I was at it. Adjusting the shifting was the same as if it were a mountain bike. Yesterday, we rode up Henry Coe, near Morgan Hill. There is one short segment with the grade getting to about 20%. Anne said the lowest gear she went into was a bit too low. I think a 11-32 cassette would have been a better choice for her, especially considering she seemed to have no problem climbing it previously with her old 12-27 cassette. Still it is nice to know there is a yet another gear in case you need it. I previously have been using my cycling oriented Garmin Edge 500 while running using a wrist strap that was really designed for the Garmin 310XT. See the prior post. Although this worked reasonably well, it still was a bit awkward. Not only did you see things in mph instead of minutes per mile pace, the display was rotated 90 degrees so I had to kind of bend my head to make it out. I finally decided to get a real Garmin running watch. I could have bought the Garmin 310XT, but since I already have the Edge 500 for cycling I did not need that multi-sport device. I also wanted something that was smaller and looked more like a watch. I had used my daughter’s Forerunner 305 but found reading the display was hard for me because the fonts were too small. While in Utah, I visited the new Runner’s Corner store where they had all the Garmin running watches to check out. I decided on the Garmin Forerunner 610, their latest model. Although this watch was mainly designed for running, it also supports cycling very well and you can switch between running and cycling very easily. While I use this new watch for running, Anne puts it on her bike for cycling while I still use my Garmin 500 for that purpose. It has a touch screen, which is much easier to use to change the display than the bezel on the prior Garmin Forerunner watches. Also the fonts are easy for me to see without my reading glasses. It weighs 2.6 oz, which is the same as the Garmin 500 with wrist strap. But the size is smaller and it just seems much easier to use while running. The battery life on the Garmin 610 is only about 8 hours. That works well for running and some cycling but would not be sufficient for the ultra distance cyclists. For a complete review of this Garmin please see this post by DC Rainmaker. He does such a great job reviewing Garmin products in depth that there is no point in my providing my own observations other than to see I really like the Garmin 610 and am glad I purchased it. While the Garmin 500 used a mini-USB connector to upload to the computer, the Forerunner 610 uses ANT+ via a USB stick you plug into your computer. This works great. Since I am uploading from two different Garmin devices, I found it best to upload from the 610 first, then plug in the Garmin 500 and upload from it. I just move those over to another folder so when I am doing a new upload I don’t see all the past ones. This video shows how to update the firmware.